A shaft sleeve is a cylindrical hollow metal tube placed over the shaft to protect as it passes through the packing. Pump shafts are often protected from erosion, corrosion, and wear at leakage joints, seal chambers, internal bearings and in the waterways by renewable sleeves. The most common shaft sleeve function is that of protecting the shaft from packing wear at the stuffing box. A shaft sleeve used between two multistage pump impellers in conjunction with the inter-stage bushing to form an inter-stage leakage joint is called an inter-stage or distance sleeve. These are used in single stage pumps. Impeller and sealing gland are not directly mounted on shaft. A sleeve is fitted between the bore of the impeller and OD of the shaft and keyed with the shaft i.e. impeller rotate with the sleeve along with the shaft. The wearable part in this type of assembly is the sleeve, which is far less expensive than the shaft. The function of the impeller sleeves is to protect the shaft from wear and coming in contact with the pumping fluid. Pump shafts are usually protected from erosion, corrosion, and wear at seal chambers, leakage joints, internal bearings, and in the waterways by renewable sleeves. The most common shaft sleeve function is that of protecting the shaft from wear at packing and mechanical seals. Shaft sleeves serving other functions are given specific names to indicate their purpose. For example, a shaft sleeve used between two multistage pump impellers in conjunction with the interstage bushing to form an interstage leakage joint is called an interstage. In medium-size centrifugal pumps with two external bearings on opposite sides of the casing (the common double-suction and multistage varieties), the favoured shaft sleeve construction uses an external shaft nut to hold the sleeve in an axial position against the impeller hub.Sleeve rotation is prevented by a key, usually an extension of the impeller key. The axial thrust of the impeller is transmitted through the sleeve to the external shaft nut.In larger high-head pumps, a high axial load on the sleeve is possible and a design similar to that shown in Figure 1 may be preferred. This design has the advantages of simplicity and ease of assembly and maintenance. It also provides space for a large seal chamber and cartridge-type mechanical seals. When shaft sleeve nuts are used to retain the sleeves and impellers axially, they are usually manufactured with right- and left-hand threads. The friction of the pumpage and inadvertent contact with stationary parts or bushings will tend to tighten the nuts against the sleeve and impeller hub (rather than loosen them). Usually, the shaft sleeves utilize extended impeller keys to prevent rotation. Some manufacturers favour the sleeve, in which the impeller end of the sleeve is threaded and screwed to a matching thread on the shaft. A key cannot be used with this type of sleeve, and right- and left-hand threads are substituted so that the frictional grip of the packing on the sleeve will tighten it against the impeller hub. As a safety precaution, the external shaft nuts and the sleeve itself use set screws for a locking device. 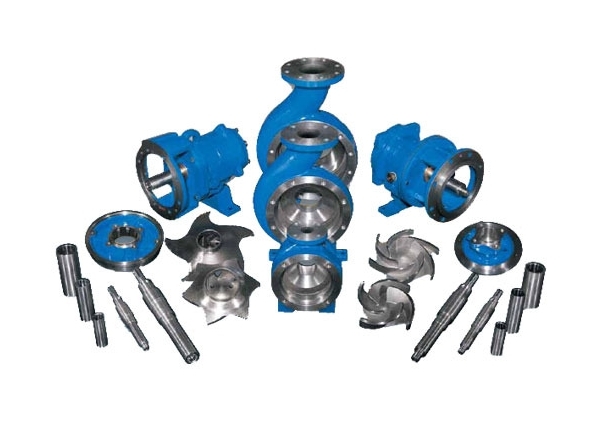 In pumps with overhung impellers, various types of sleeves are used. Most pumps use mechanical seals, and the shaft sleeve is usually a part of the mechanical seal package supplied by the seal manufacturer. Many mechanical seals are of the cartridge design, which is set and may be bench-tested for leakage prior to installation in the pump. For overhung impeller pumps that utilize packing for sealing, the packing sleeves generally extend from the impeller hub through the seal chambers (or stuffing boxes) to protect the pump shaft from wear. If a hook-type sleeve is used, the hook part of the sleeve is clamped between the impeller and a shaft shoulder to maintain the axial position of the sleeve. A hook-type sleeve used to be popular for overhung impeller pumps that operate at high temperatures because it is clamped at the impeller end and the rest of the sleeve is free to expand axially with temperature changes. But with the increased use of cartridge-type mechanical seals, the use of hooktype sleeves is diminishing. In designs with a metal-to-metal joint between the sleeve and the impeller hub or shaft nut, a sealing device is required between the sleeve and the shaft to prevent leakage. Pumped liquid can leak into the clearance between the shaft and the sleeve when operating under a positive suction head and air can leak into the pump when operating under a negative suction head. This seal can be accomplished by means of an O-ring, or a flat gasket. For high temperature services, the sealing device must be either acceptable for the temperature to which it will be exposed, or it must be located outside the high temperature liquid environment. According to an alternative design used for some high-temperature process pumps, the contact surface of the hook-type sleeve and the shaft is ground at a 45-degree angle to form a metal-to-metal seal. That end of the sleeve is locked, but the other is free to expand with temperature changes. When O-rings are used, any sealing surfaces must be properly finished to ensure a positive seal is achieved. All bores and changes in diameter over which O-rings must be passed should be properly radiused and chamfered to protect against damage during assembly. Guidelines for assembly dimensions and surface finish criteria are always listed in O-ring manufacturers’ catalogs. At Global Pumps & Spares, we keep a full range of shaft sleeves in ready stock. Shaft Sleeve M.O.C. – EN8, EN19, C.I, S.S 410, S.S 304, S.S 316, Bronze etc. Manufactured from best quality raw materials, the Pump Shaft Sleeves are available in different grades and sizes as per the needs of our esteemed customers. An impeller in a pump is the part that the motor spins and that actually does the work of moving the water. Due to it’s design when the impeller spins it creates a vacuum that pulls the water or liquid in the middle of an opening on the front of the impeller (suction side) and throws it to the outside through the discharge where it is then channeled to the output of the pump. The impeller is the fan like disc that actually propels the liquid in the pump chamber. Impeller makes the flow to acquire speed and velocity in a centrifugal pump. The purpose of pump is increasing the pressure of the water. A centrifugal pump has an intake that allows liquid to enter the pump. Inside of the intake apparatus is a disc with fins which is attached to a motor . The propeller turns at a high speed and gives the ability to pump more water. Impellers of pumps are classified based on the number of points that the liquid can enter the impeller and also on the amount of webbing between the impeller blades. Impellers can be either single suction or double-suction. In a single-suction impeller ,liquid enters the center of the blades from only one direction. In a double-suction impeller, liquid enters the center of the impeller blades from both sides at he same time. Impellers can be open, semi-open, or enclosed. The open impeller consists only of blades attached to a hub. The semi-open impeller is constructed with a circular plate attached to one side of the blades. The enclosed impeller has circular plates attached to both sides of the blades. The impeller sometimes contains balancing holes that connect the space around the hub to the suction side of the impeller. The balancing holes have a total cross-sectional area that is considerably greater than the cross-sectional area of the annular space between the wearing ring and the hub. The result is suction pressure on both sides of the impeller hub, which maintains a hydraulic balance of axial thrust. Impellers are selected on the basis of the pump design requires and the application of the pump. Generally speaking, the higher the number of vanes in the impeller, the greater is the efficiency of the impeller. The performance curve of a pump is also affected by the number of vanes. The brake horsepower varies as a cube of the impeller diameter. At Global Pumps & Spares, we keep a full range of Impellers in ready stock. Impeller M.O.C. – EN8, EN19, C.I, S.S 410, S.S 304, S.S 316, Bronze etc. Manufactured from best quality raw materials, the Pump Impeller are available in different grades and sizes as per the needs of our esteemed customers. Pumps are a very important part of a factory’s operations. Breakdown of a pump can lead to serious problems in operations, including complete stoppage of the factory. Due to this pump repairing has to be done quickly and efficiently. To repair a pump, availability of spare parts is very crucial. Without all required spare parts, the pump cannot come into operation again. Even if a single spare part is not available, the whole pump becomes unusable. 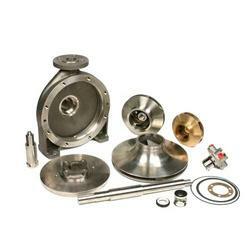 We offer all types of spare parts for Kirloskar centrifugal pumps. The most important spare parts in a pump are impeller, shaft, shaft sleeve, bearing housing, casing cover, oil seal, mechanical seal, etc. Distributors of Kirloskar pumps are an essential part in the supply chain. Distributers of Kirloskar pumps should ensure availablity of materials as factories rely on them.